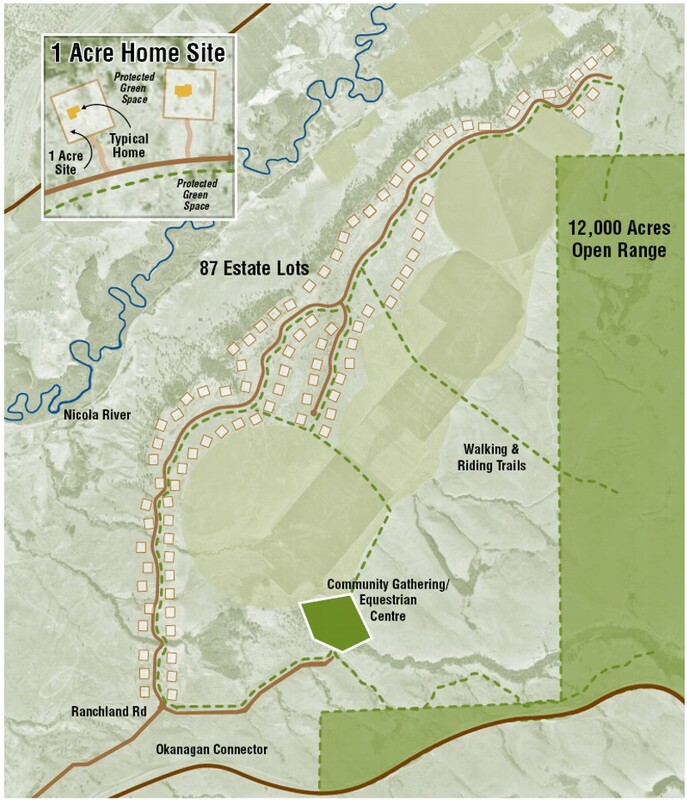 Ranchland Estates is a 900 acre, 87 home site bare land strata located along the edge of a 6 kilometer plateau overlooking the Nicola Valley. Careful master planning maximizes the amount of green space surrounding each home site, while guaranteeing privacy and maintaining the sense of wide-open living among rolling grassland hills. A home site purchaser acquires a 10 acre interest involving a deed to both a 1 acre home site and the panhandle driveway with the remaining 9 acres pooled together to form protected common land or green space. Each 1 acre home site is surrounded by undisturbed and protected common land thereby guaranteeing “What you see is what you get … forever.” The use of the common land is limited by incorporating a covenant that is attached to the land title of the common property. With over 80% of the 900 acre site as protected green space, the beauty of the natural environment will remain. This environmentally-sensitive approach supports Ranchland Estates’ vision of sustainability and conservation, and provides assurance that the integrity and natural beauty of the land will be preserved for the enjoyment of future generations. See photo gallery Views for spectacular 360 degree views from home sites.